The global market for microfluidics is predicted to witness a high level of competition, owing to the presence of a large number of players operating in it, states a research report by Transparency Market Research. Moreover, the rising number of players expected to enter the global market is likely to generate lucrative opportunities for the key players throughout the forecast period. In 2016, some of the prominent players operating in the global microfluidics market, namely Danaher Corporation, F. Hoffman-La Roche AG, and Thermo Fisher Scientific collectively held a share of 53% of the global microfluidics market. These players are focusing on the expansion of the product portfolio in order to enhance their market presence and attain a leading position in the market throughout the forecast period. According to the research study by Transparency Market Research, in 2016, the global market for microfluidics was worth US$ 4.76 bn. The market is likely to register a progressive 11.40% CAGR between 2016 and 2025, reaching a value of US$12.45 bn by the end of 2025. From a geographical perspective, in the last few years, North America led the global microfluidics market and accounted for a key share. As per the report, the market is estimated to remain in the leading position throughout the forecast period, thanks to the rising rate of adoption of new and innovative products. In addition, the presence of several prominent players operating in this region is likely to encourage the growth of the North America market in the next few years. 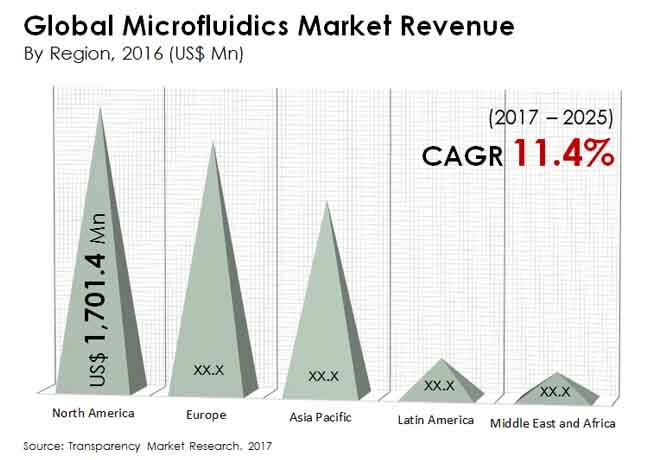 On the other hand, Asia Pacific is estimated to offer promising growth opportunities for the key players in the microfluidics market. Technological developments and the rising geriatric population are some of the key factors that are projected to accelerate the growth of the Asia Pacific microfluidics market in the forecast period. In terms of product type, the global microfluidics market has been classified into microfluidic chip, instruments, cartridges and reagents, and others. Among these, the cartridges and reagents segment is estimated to witness a substantial growth throughout the forecast period. This segment is likely to lead the global microfluidics market and hold a massive share in the next few years. The high growth of this segment can be attributed to the rising adoption of microfluidics products in diverse industries and laboratories. The instruments segment is projected to follow the cartridges and reagents segment throughout the forecast period. The rising awareness among consumers regarding the benefits of using microfluidic technologies and the expansion of the product portfolio are anticipated to encourage the growth of the global microfluidics market in the next few years. The reduced cost of procedures and the reduced wastage of reagents are estimated to accelerate the development of the overall market in the coming years. Furthermore, the tremendous rise in the geriatric population and the increasing cases of cancer, diabetes, and other disorders are predicted to supplement the development of the global microfluidics market in the near future. The global microfluidics market, on the other hand, is estimated to face several hurdles in the next few years. The strict regulatory framework and concerns related to the approvals for new products are expected to hamper the growth of the global market in the next few years. In addition, the high excise duty on these products is another major factor projected to curtail the market’s growth over the forecast period. Nonetheless, the growing demand for cost-effective therapeutics and the rising preference for point-of-care diagnostics are estimated to accelerate the growth of the global microfluidics market in the coming years.